haven't yet shifted." The bombs were concealed in a truck and a minibus. officials said. The second blast killed some of the rescue workers who had rushed to the scene, which was obscured by billows of black smoke. "It's horrifying, terrible," said Mark Lipdo of the Stefanos Foundation, a Christian charity based in Jos, who described the sickening smell of burning human flesh. 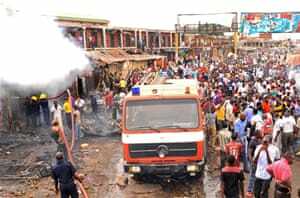 President Goodluck Jonathan condemned the blasts, calling the perpetrators "cruel and evil". "The government remains fully committed to winning the war against terror, and this administration will not be cowed by the atrocities of enemies of human progress and civilisation," he said in a statement issued by his office. Boko Haram violence Al Jazeera's Mohammed Adow, reporting from the capital, Abuja, said there was no immediate claim of responsibility for the attack. "However, suspicion will most likely fall on the group Boko Haram," he said. Boko Haram grabbed world headlines with the abduction of more than 200 schoolgirls a month ago from a remote village in the northeast. Britain, the United States and France have pledged to help rescue them.